Note to readers: This blog post is about an intranet I was responsible for 2003–2012. “A top task on an intranet is finding people. […] If you’re running an intranet you must excel at finding people.” This is what intranet guru Gerry McGovern says when speaking about what an intranet manager should focus on. I have for some years wanted to change City of Malmö’s way of finding people into something better, into a more user friendly solution. Until now the way for looking up a person in the organization has been rather cumbersome. A database separate from the intranet with a problematic UI, data about a person hidden away in hard-to-navigate expanding views, only surname search, few and wrong tags/keywords on people, no photo, no self-service edit of your data and less than 50 percent of the employees in the database. Understandably, the users have had many negative comments about the system. In the yearly intranet survey the most commented feature has been the phone book. Many do not like it. This year the time was right for suggesting a change. Today our new staff directory went live. Click in the search field in the masthead. Start typing a name in the people search box, choose in the auto suggest list or make a full search with the Search button or Enter. See all data about the person on his/her profile page. Phone status (e.g. “In a meeting from 12am to 2 pm”, from the PBX system; close the land line, then reason and duration shows here). 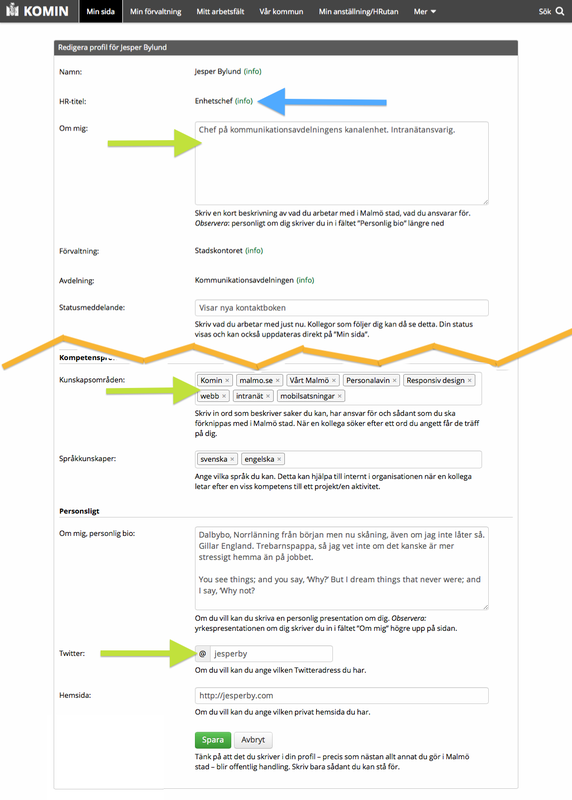 Almost all of the data is possible to self-service edit, either directly in edit mode, or by trigging the right change routine. Data about you that is not possible to edit directly have clear information texts telling the user how to act to trigger each change routine. Approximately 40 percent of the fields are pre-filled from the beginning. Edit mode in the staff directory. Blue arrow shows a field with info about how to trigger the right change routine, green arrows is examples of direct edit fields. 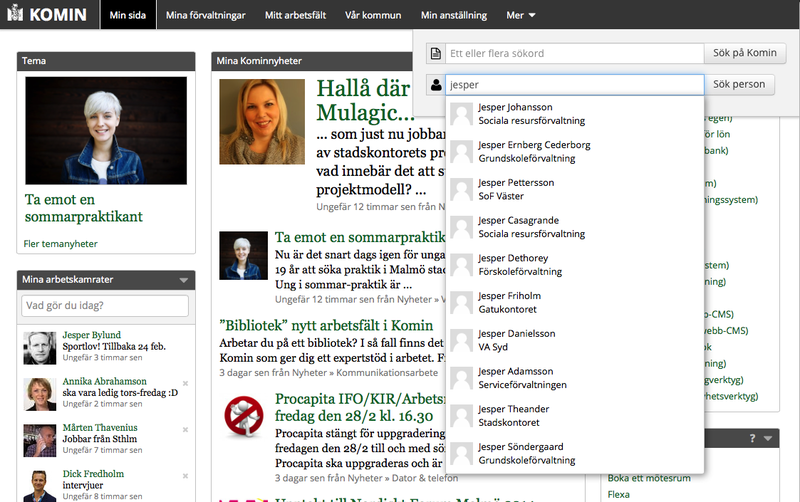 The new staff directory has extensive cross-linking, everything green on the profile page is links. This means you can start on one employee and proceed to his/her manager, department etcetera. Keywords about you are also links, so you can se a list of everyone using the keyword. 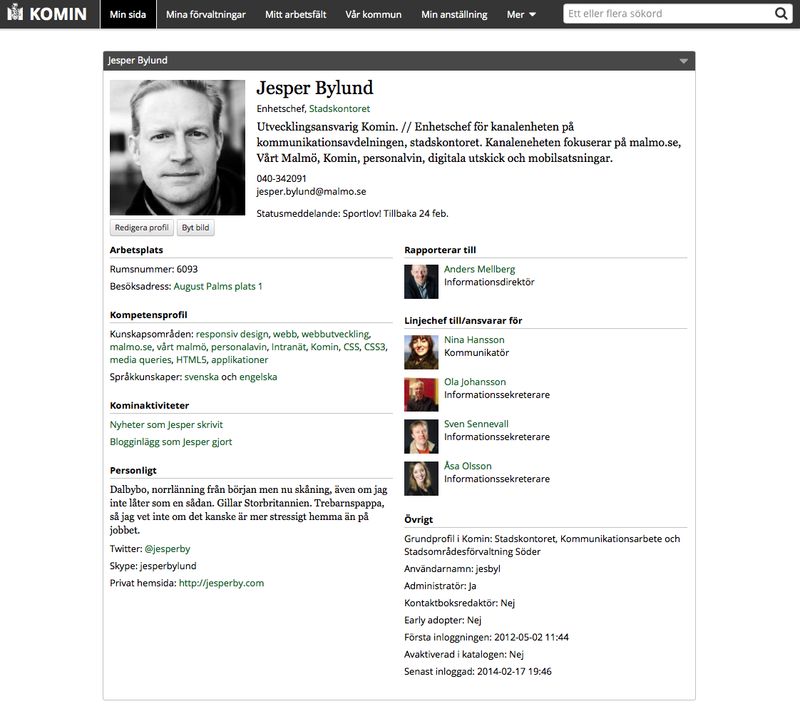 The profile page at 20em. The new staff directory gets most of the data from the central AD. Things we have not found in the AD and things the user can edit directly are stored locally in the dashboard, but if another IT system in the organization would like to use the data we are ready to export back to the AD. The photo is maybe the most obvious local data to make available to other systems. The goal is to make no point-to-point integrations and instead use the AD as a central hub for information about the employees. When developing the the staff directory we have had great help from a Step Two Design whitepaper (they do not sell it anymore, I think) and S2D articles, and a whitepaper from Fredrik Wackå (in Swedish). The staff directory is a part of the intranet dashboard, built i Ruby, and Open Source. You can download it at Github. And of course it has responsive design. By integrating the staff directory closely with the personalized intranet dashboard we can use the data in a lot of exciting ways in the future, e.g. more exact personalization, and tailor the search results based on your department, job role and skills. I hope Gerry McGovern is right and the top task on an intranet is finding people, because the staff directory is the intranet feature I have loved the most to build so far! I think the new UI is straight-forward, the information about a person extensive and the cross-linking really useful. Hopefully the end-users will also think the new staff directory is a great intranet service! Looks like you’ve got it figured out! Well done!